A great blaster for introducing great darts. “Zenith” is defined as “the time at which something is most powerful or successful”. The name seems appropriate, because Buzz Bee Toys is pushing to rival Nerf as the king of foam blasters. With blasters like the Zenith, it may very well be possible. 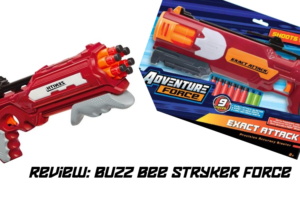 As seen way back in February, Buzz Bee made a new effort into fulfilling consumer expectations from their blasters. One prong of that effort consisted of making accurate darts; it turned out successful. The Precisepro darts consistently fly towards their target, absent bad aiming and forces like the wind. And they feed through all stock dart-firing systems I’ve tested so far. You can read the linked blog post for more dart info. The blaster, meanwhile, is a pump action revolver, with an elongated body to accommodate the priming handle. The rear handle is contoured on the thin side, such that adult hands can’t firmly grip it at the top. It’s annoying, but ultimately affects little. Given the small size and weight of the blaster, the user has no need to “death grip” the toy. The included ladder sight is surprisingly helpful for making distant shots, although that only occurs with the included darts. Trying to use long-distance or Nerf Elite darts leaves something to be desired in the accuracy department. 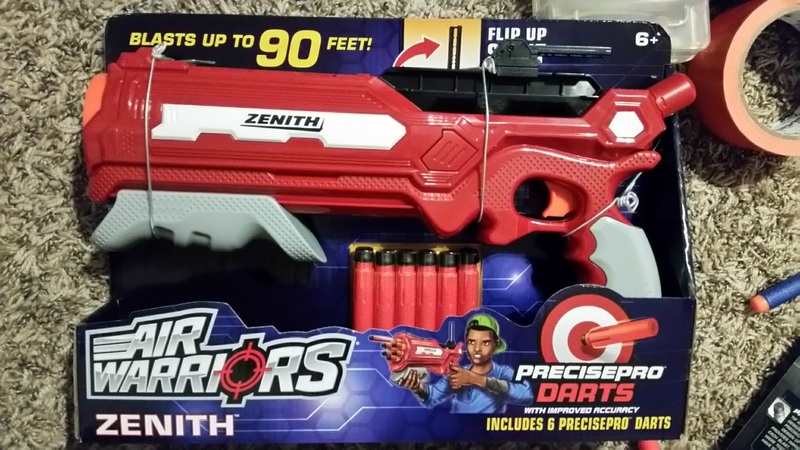 The Zenith uses an interesting system that seasoned Nerf modders should be familiar with. 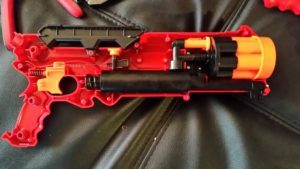 Homemade bullpup blasters have featured pump action priming, with the air channel from the plunger tube diverting upwards (for example, the BullPAC). Think of it as the most efficient way to set up an RSCB, without an extra elbow at the front. In this case, however, the air feeds into a six-shot cylinder. The resulting air channel is longer than I’d like, but clearly is what Buzz Bee needed to meet their target specs. 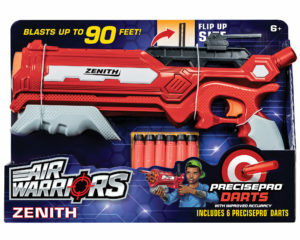 With a beefy spring, a 1.05″ ID plunger tube, and roughly 2 3/4″ draw, the Zenith is probably using the tube to drop performance to acceptable (read: legal) limits for a toy. 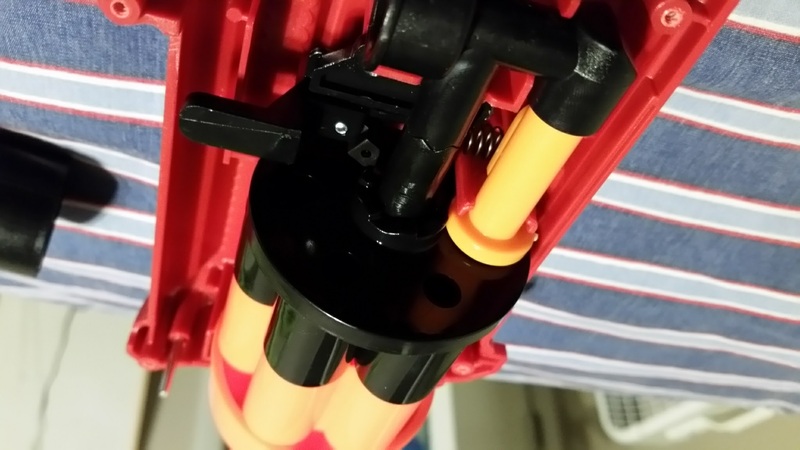 The rotation mechanism is very compact compared to other blasters. The priming rod has a slope built into it, which raises a sliding piece. That piece sits directly behind the cylinder and engages a ratchet mechanism, resulting in 1/6 of a turn on each priming motion. 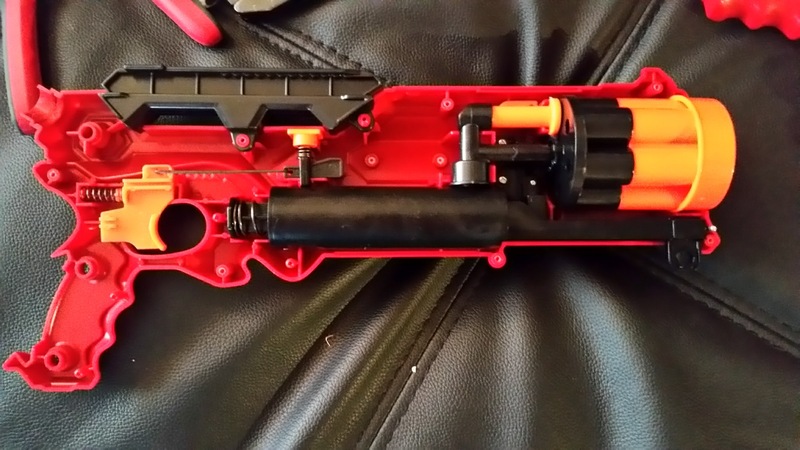 In stock form, you can hear the plunger impact noticeably after the dart has left the blaster and re-engaged the air restriction valve. That means there’s more power that can be harnessed, without needing to fiddle with new springs. The cylinder is completely solvent welded together. In stock setup, the darts sit with the front portion of the darts exposed. 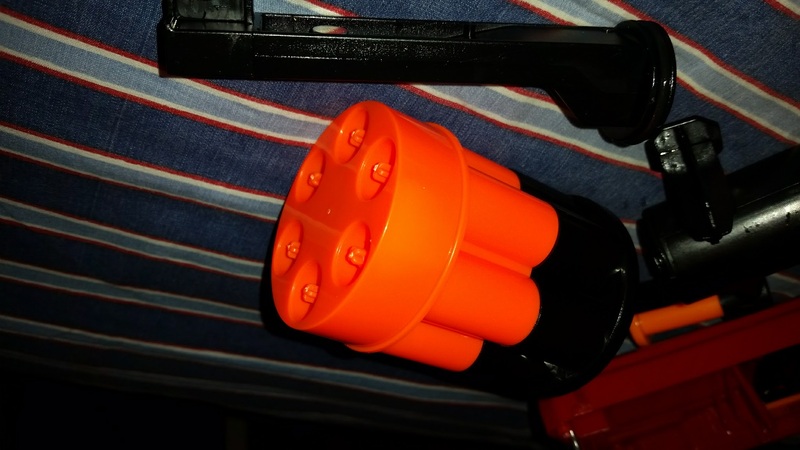 However, careful use of various drill bits can be used to remove the pegs (from the back), then the restrictor plates and springs (from the front), allowing use of the entire barrel length and higher velocities. Credit goes to my friend Zombona Machine for figuring out the proper method. In testing, the Zenith showed remarkable power even in stock form. Both the included Precisepro darts and Nerf Elites averaged 78 fps, although only the former had any accuracy whatsoever. Next, Buzz Bee’s Long Distance Darts hit a robust 82 fps. Finally, Accustrike darts were straight and true at a lower 72 fps. The Zenith comes in three versions. Mine, from Kmart, includes a ladder sight. The Target version includes the new Thermal Scope (which will have its own review). Walmart sells a reshelled version called the “Exact Attack” under their Adventure Force brand. Nevertheless, you can buy any version as an excellent addition to your arsenal. The Zenith has annoying styling quirks with the grip. But if that’s the only complaint, then the blaster is well worth the money. 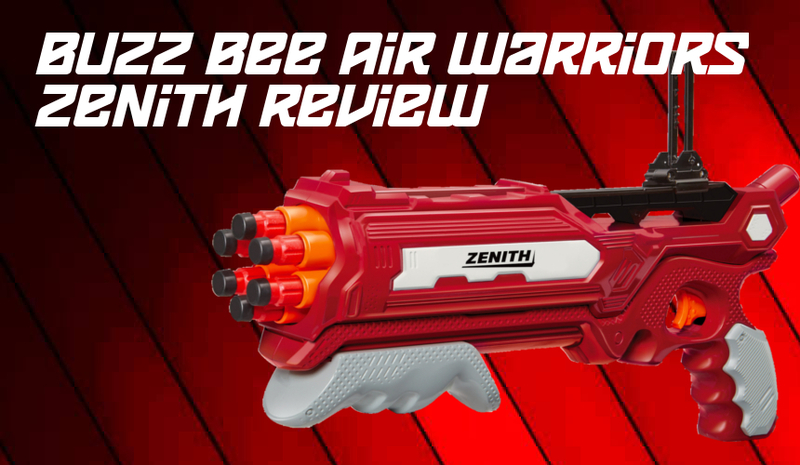 This entry was posted in Dart Blasters, Reviews and tagged 2017, Air Warriors, buzz bee, precisepro, zenith on July 30, 2017 by BuffdaddyNerf.